Ahhh, too cute, too cute! 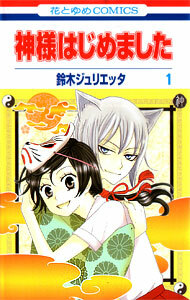 Fox ears and a kitsune mask on a cover will almost guarantee a purchase by me 🙂 SUZUKU Julietta is the author of another series I enjoyed, Akuma to Dolche and one that I look forward to reading eventually, Karakuri Odette. I really like her art style. It is simple but pretty, and there are some really funny facial expressions and scary demons too. This is the first volume of what I hope will be a lengthy series. The story structure has the potential to be an episodic story or a serial/continuing story. I am curious to see how long this will last. MOMOZONO Nanami is a girl in a tough situation. Her already poor family situation just got worse. Her foolish father has gone and gotten himself into serious debt and has run off, abandoning her. People have come and taken away all of her meager possessions. Penniless and alone, she is sitting in a park, fuming over what her stupid father did, and trying to figure out what she will do, when she meets a very strange person. It is a guy in a tree. He is clinging to the top branches for dear life, looking down at the barking dog below in sheer terror. He begs her for help, so Nanami shoos the dog away. What a funny guy. He is cute in a dorky kind of way. In his suit, scarf, and glasses, he looks kind of helpless, but there is also something sort of mysterious about him. His personality is cute too. He is extremely grateful to Nanami for her help, and very concerned for her when she mentions that she is now homeless. He seems to be an emotional kind of guy. But he likes Nanami, and tells her that she can stay at his house! No, he is not suggesting they live together. He will be away traveling, and she can take care of his house in his absence. This sounds great to Nanami, and she accepts his offer. Almost as a sign of their agreement, he kisses Nanami on her forehead and walks away. Nanami is a little confused and dazed by this. Then, when she gets to the location where his house is supposed to be, she is surprised to discover that it is a temple! Even more shocking is the fact that it is not uninhabited! Nanami is greeted by some sort of… being. A god? A demon? He is tall and slender, dressed in flowing kimono-like garb. His hair is short, and he has animal ears. He is very beautiful and elegant, and holds a fancy fan in one hand. When he sees Nanami, he calls her “Mikage-sama” and welcomes her back, declaring he will kill her! However he soon realizes that Nanami is not the Mikage-sama he was expecting, and she is spared. This demon’s name is Tomoe. The guy Nanami met at the park was Mikage, some kind of god of the shrine grounds. Well, he WAS the god. It turns out that when he kissed her forehead, the stranger relinquished his role and assigned the position of shrine god to Nanami! A high school girl as a shrine god? Tomoe is supposed to be a servant of Mikage, but he doesn’t act like it. His personality is very haughty, and he doesn’t seem to expect much from Nanami. How can she possibly live in a shrine with this strange guy and his demon servants? How can she be a god?! Poor Nanami is in a strange situation indeed! She is forced to deal with the arrogant and mysterious Tomoe, not to mention all the weird supernatural things she can now see. A whole new world has opened up for Nanami, and some of it can be pretty dangerous! I really liked the dynamic relationship between Nanami and Tomoe. They argue a lot, and there are many funny moments. I look forward to volume 2!